Tiny semiconductor particles known as "quantum dots" have been used in a sensor that could make for mobile phone cameras that outperform larger cousins. A film made from these dots is more light-sensitive than existing approaches to camera sensors, according to its makers, Invisage. That means that cameras made using the film need not be as large as some to achieve the same performance. InVisage suggests the films will make it into camera production by mid-2011. Digital camera sensors rely on silicon to do the crucial business of turning incoming light into an electric charge that the camera can measure and translate into an image. 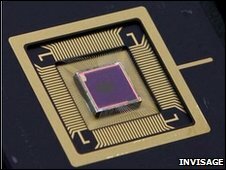 But the way silicon-based sensors are produced means that in many cases the light is partially blocked by the electronic connections that make the sensor work. Combined with the fact that silicon can turn only half of the incident light into electric charge, capturing light using silicon throws away about 75% of the light. "It is becoming increasingly difficult and expensive to develop next-generation image sensors using silicon; essentially, silicon has hit a wall," said Jess Lee, the company's chief executive. "The fundamental problem is that silicon cannot capture light efficiently, but until now it has been the only option." That is where quantum dots come in. They are so named because they are single, tiny dots of semiconductor material whose light-absorbing properties - their predilection to absorb specific "quanta" of light energy - can be tightly controlled during manufacture. Invisage makes a soup of these quantum dots and spins it into what it calls a QuantumFilm. The firm said the approach could be easily integrated to existing semiconductor manufacturing methods. Because each quantum dot is so small, up to three times as many "pixels" can be squeezed into a given space, and the higher sensitivity gives better performance in low-light conditions. The company will formally unveil the technology at the Demo conference in California, which runs from 21 to 23 March.